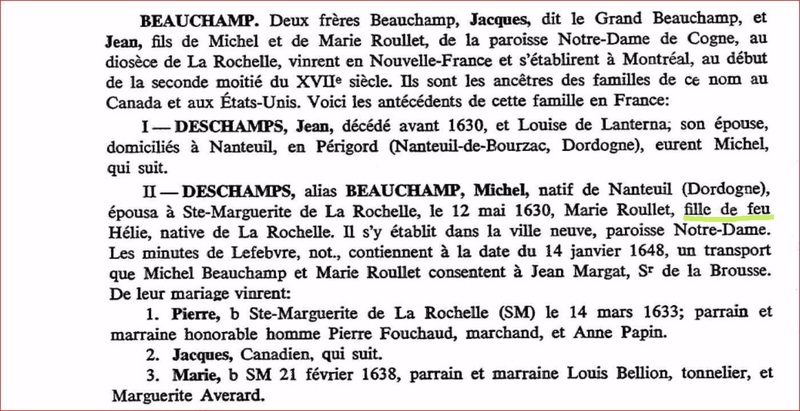 Researching the Beauchamp family in France has been joyous and frustrating at the same time if not a little overwhelming. There is so much history in France and I find my self drawn into the lives of the family over there. There were a few new discoveries that traumatized and confounded me. This information I would not have found if I simply went by transcripts but I instead took the time to read whole records where found. You will note the words “fille de feu” underlined. Not being fluent in French does make it a struggle at times but I guessed at “feu” being smoke. My over-active imagination went immediately to the siege at La Rochelle and from there to the fact that some of the family were Huguenot. Oh God, was she burned at the stake as a heretic?! To the web! A hundred horrible images came up for “girls on fire” but finally after persisting and not a little nausea, I hit a woman who had the definition. As usual, I had parsed wrongly and left the last word off, Helie. I knew it was a name but of who, where? What the term means is ” the daughter of the LATE Helie (her father). Just a slight relief, although her parents were Huguenot, her father in some records known as Elie. Also, in this record, you find the words “parraine” and “marraine” (godfather and godmother) and their status. Pierre’s godfather is “un honorable homme” and a merchant. Marie’s godfather is a cooper. So working class people. We also find out that there was a younger brother, Guillaume (William) who died at age 6. Jacques is said to be the start of the family in Canada, whatever happened to Pierre who also emigrated I don’t know. In the record, Jacques’ godfather is also Jacques, so we are given another member of the family who is probably his uncle. He married Marie Dardayne in France 3 years before they emigrate and they have boy Jacques who is one year old when they arrive here. We don’t hear of little Jacques after that. Then they have 8 more children in Canada. Further down the page, we are to be confounded more by this information. Here you have a family of Huguenots with pretty much the same names as our family, possibly cousins to our ancestors. It almost appears that the family was split down the middle starting on or before the marriage of Marie Roullet’s parents. The information is out there somewhere I am sure. I had originally thought that there were no signs of the family intermarrying with the natives, that based on the fact that all names were French and yes, I should have known better. My grandfather, down the line from this family, married a Daigneault (my grandmother) who is listed on the 1906 Canada census as Cree along with the rest of her family. I did think that was a little strange. HOWEVER, I came across a website,metis-history.info by searching for Pierre Beauchamp,the oldest brother. I hit two boys in there who were I believe, the sons of Jacques senior, Pierre b. 1676 and Jacques born 1678. They were listed as “canotier” which I take as voyageurs. They arrived at Detroit on May 30th, 1706. So another story which totally blends in with the theme of New France, the romanticized “voyageurs” and “coureurs des bois”. Before they were even born though, land had t be cleared and homes and churches built . 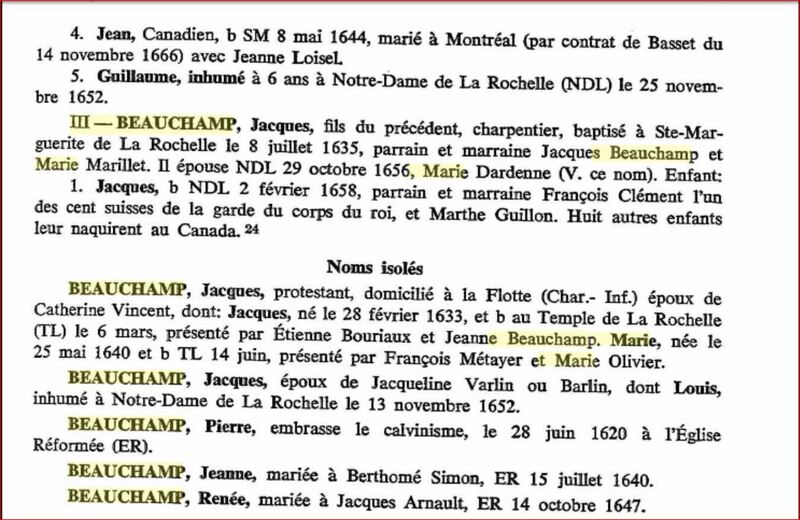 This entry was posted in France, Jacques Beauchamp, New France, Researching, The Family in Canada and tagged genealogy, Huguenots, Jacques Beauchamp, New France by Shamwest. Bookmark the permalink.